You know soda’s not exactly good for you — but at the same time, it can be hard to resist. Its sweet taste, pleasant fizz and energizing jolt often seems like just what you need to wash down your dinner, get you through an afternoon slump or quench your thirst at the movies. But the more soda you consume (regular or diet), the more hazardous your habit can become. And whether you’re a six-pack-a-day drinker or an occasional soft-drink sipper, cutting back can likely have benefits for your weight and your overall health. The biggest risk for regular soda drinkers is the excess calories, says Lona Sandon, RD, assistant professor of clinical nutrition at the University of Texas Southwestern Medical Center. “The calories in regular soda are coming entirely from added sugar, and you’re not getting any value in terms of vitamins or minerals, or even good quality carbohydrates,” she says. But soda may also be causing other types of harm. Studies have shown that its consumption is linked with tooth decay and diabetes, and it also seems to be bad for your bones. “It may have something to do with the phosphorus in soda, or it could be that people are drinking soda instead of other beverages — like milk — that have nutrients necessary for healthy bones,” Sandon says. Plus, diet drinks have many of the same health risks as regular soft drinks, including tooth decay and bone thinning, and they’ve also been linked to heart disease and depression in women. Switching to diet sodas may be a smart first step if you’re trying to eliminate excess calories, says Sandon, but your best bet is to eventually give them up, too. Here’s how to make the transition easier. If you typically drink multiple servings of soda a day, Sacks suggests first cutting back to one a day. Give that two weeks, then switch to three sodas a week. “It gives you a chance to adjust gradually, which should lead to real, sustainable change,” says Sacks. Sandon also recommends weaning yourself slowly off soda, and sometimes suggests that her clients start drinking half-soda, half-water. “You’re automatically drinking less and hydrating and filling up with water, which is a good thing,” she says. Downloading a calorie-tracking app may help you realize just how much those beverages can affect your daily calorie consumption — as long as you actually log in and record each serving. Instead of pouring yourself refill after refill, start paying attention to how much you’re actually drinking; once you do, you may be more willing to cut back. Another way to quantify the calories you’re drinking is by thinking about how much exercise it would take to burn them off. In a 2014 Johns Hopkins University study, researchers placed signs in corner stores stating that a 20-ounce bottle of soda would take 5 miles of walking or 50 minutes of jogging to burn off. These “advertisements” worked: When teenager customers saw these signs, they were more likely to buy a smaller soda, a water, or no drink at all. “When you explain calories in an easily understandable way such as how many miles of walking needed to burn them off, you can encourage behavior change,” said the study authors. Need that jolt of caffeine to wake up in the morning? 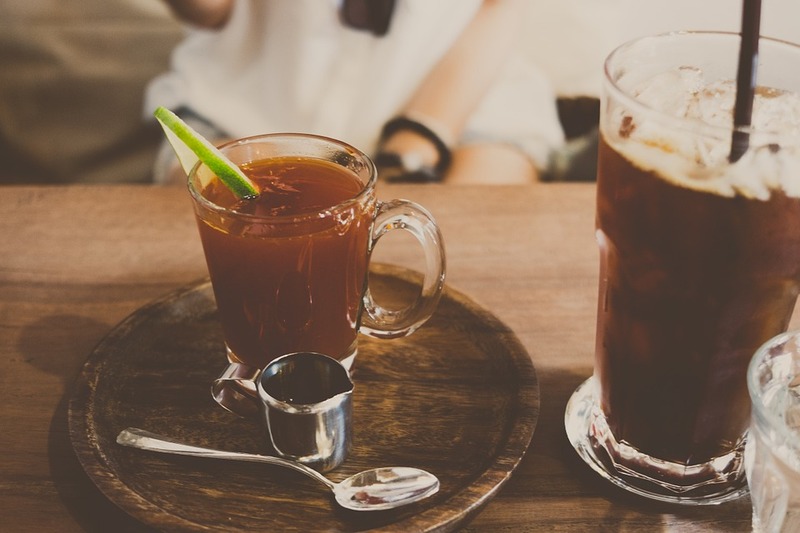 If you’re not a coffee drinker, Sandon suggests sipping on unsweetened iced tea instead. “It can be just as refreshing, and there are real health benefits to drinking the phytochemicals in tea,” she says. If you don’t like the taste of plain tea, mix in some lemon, mint, or a small amount of sugar or artificial sweetener — at least during your transition-from-soda phase. The important thing is that you’re aware of, and in charge of, exactly what’s going into your drink and how much is added. Whenever the urge to drink a soda hits, fill up a big glass of ice water and finish that first. “A lot of times, people drink soda just because they’re bored, or they’re thirsty, and that’s what’s available or that’s what they’re used to,” says Sacks. If it’s carbonation you crave, try drinking plain or flavored seltzer water, suggests Sacks. You can buy seltzer by the bottle, or make your own at home with a SodaStream machine. Even still water (or non-bubbly) can be made more palatable with the addition of some fruit or natural flavors. “People tell me they don’t like water, but often they just need to experiment with new ways to drink it,” says Sandon. She recommends adding lemon, orange or cucumber slices to a pitcher of water in your refrigerator, which can serve as a detour when you go hunting for a cold soda. Frozen berries and fresh mint can also be tasty additions to a cold glass of H2O. If you drink a lot of soda and you’re not quite ready to give it up, try buying caffeine-free versions instead. You may start drinking less without even realizing it, suggests a 2015 study published in the British Journal of Nutrition. In the study, participants were split into two groups and all told to drink as much soda as they’d like for the next 28 days. (One group got regular, one group got caffeine-free.) Even though there was no noticeable taste difference between the two, the caffeinated group drank 53 percent more over the next month — about 5 ounces a day. When our bodies get used to regular caffeine, we crave more of it, say the study authors, prompting us to drink more. You may notice that you only drink soda in certain places or situations: In the afternoon at the office, for example, or when you eat at a certain restaurant. You may not be able to completely avoid these scenarios — you’ve still got to go to work and should still enjoy eating out — but you may be able to change those bad habits. If it’s the office vending machine that tempts you to buy a soda every day, try to stay away from it in the afternoon — and pack your own healthy beverage or a refillable water bottle so you have an alternative. Or if you tend to crave soda with a certain type of food, try restaurants that offer other options instead.